Collections API is the most popular and widely used utility API in the Java universe. With the advent of Functional Interfaces, Lambdas and Streams in Java 8, Collections API has also undergone changes to accomodate and build-upon the newly introduced functional programming features. The most widely used Collection classes and interfaces such as Iterable and Iterator, Collection, List and Map have all been enhanced in JDK 1.8 with new features and methods. This is the 1st article in a 4 part article series in which I will cover the changes introduced in Java 8 Collections in detail. In this part 1 of 4, I will be covering the new default method named forEach() introduced in java.lang.Iterable interface with examples. This will be followed by understanding the new default implementation of Iterator interface’s remove() method, and how it makes implementing the Iterator easier than before. Iterable interface is a commonly extended interface among the Collections interfaces as it provides the ability to iterate over the members of a collection. Collection, List and Set are among the important Collections interfaces that extend Iterable, apart from other interfaces. – forEach() is implemented in the Iterable interface itself as a default methodTutorial explaining the concepts of Java 8’s new default methods. Iterable.forEach() method ‘consumes’ all the elements of the iterable collection of elements passed to it. The logic for consumption is passed to the method as an instance of a Consumer functional interface. An important point to note is that the forEach method iterates internally over the collection of elements passed to it rather than externally. You can read about declarative internal iterators and how they differ from commonly used external iterators in this tutorial hereClick to read detailed tutorial explaining internal vs external iterators. A List of primitive ints, named intList, is created using the Arrays.asList() method. forEach() method is invoked on the List instance – intList. As we read above, List inherits the forEach() method’s default implementation from Iterable interface. We pass a method referenceClick to read tutorial on Java 8 Method References to System.out.println() method, which is a Consumer type of function, as parameter to the forEach() method. forEach() method internally iterates and consumes, or prints, the elements of intList. Next we created an instance of a Set, named intSet, by using its concrete implementation HashSet. Set also inherits Iterable. Hence, we are able to print the elements in intSet using the forEach() method similar to the way we did with intList. Prior to Java 8, implementing Iterator interface without the support for remove() method implied that the designers had to override the method and throw an UnsupportedOperationException. Such an override was commonly done and over the years had become kind of staple in Iterator implementations not supporting the remove operation. With Java 8 arrived the feature of adding default implementations of methods in interfaces itself. Java designers have used this new feature and added a default implementation of the remove() method in the Iterator interface itself which throws UnsupportedOperationException. As a result, the practice of overriding the remove() method, whenever it wasn’t supported, has now been inverted to overriding the remove() method only when remove functionality has to be implemented. This has removed the unnecessary overhead of overriding and throwing the UnsuportedOperationException everytime when implementing an Iterator without remove functionality. As you can see in the above code, the default implementation of Iterator.remove() method just throws an UnsupportedOperationException with message "remove". 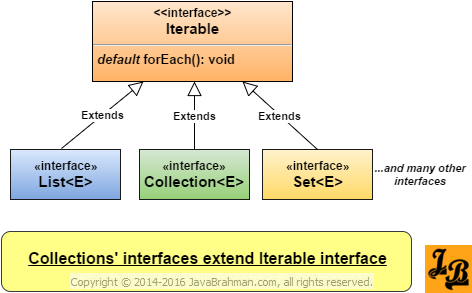 In this tutorial we dipped our feet into the waters of Java 8 Collection Enhancements by taking a look at the changes in Iterable and Iterator interfaces. In the forthcoming parts I will be taking you to the depths of Java 8 Collections enhancements, where I will explain the changes in important Collection classes viz. Collection, List and Map interfaces. Specifically, among the Map enhancements we will take a look at the new methods added in Java 8 which make multi-value maps handling easier than before.